Aerospace engineering student James Lankford has received a 2015-2016 graduate scholarship from the Achievement Rewards for College Scientists Foundation (ARCS). The scholarship is a renewable $15,000 stipend for outstanding graduate students in the fields of engineering. 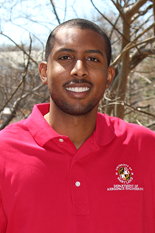 Lankford is a Ph.D. student working under the advisement of Distinguished University Professor Inderjit Chopra. He received his B.S. in Aerospace Engineering from Virginia Tech in 2011 and his Master’s in Aerospace Engineering from the University of Maryland in 2014. While in graduate school, he was a member of the Aerospace department’s rotorcraft student design team which placed 1st in the graduate division of the American Helicopter Society’s 30th annual student design competition. In addition, Lankford received the National GEM Consortium Minority Fellowship for 2011-2013, and he was awarded as an Alfred P. Sloan Scholar in 2014. He also serves on the Department of Aerospace Engineering's Graduate Student Advisory Committee and is the Lockheed Martin Scholar. Lankford is currently performing research related to further understanding the fundamental principles associated with flexible, flapping wing, micro-air vehicles (MAVs) through a multi-disciplinary approach. Specifically, he is developing and validating a coupled, high fidelity aeroelastic solver to model the fluid/structure interaction inherent to flexible flapping wings and determine how it influences wing performance. Ultimately, his research goal is to utilize the aeroelastic analysis to aid in the design process of future flapping-wing MAV concepts in order to improve aerodynamic performance and efficiency. 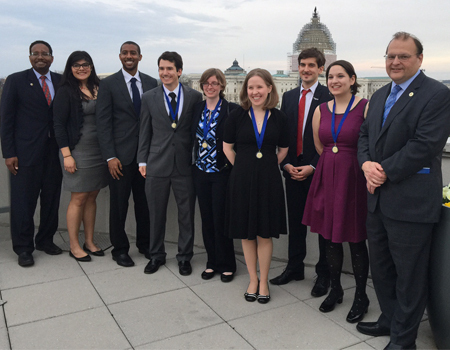 Lankford (third from left) pictured with fellow UMD students and Clark School of Engineering Dean Darryll Pines (far left) and Department of Aerospace Engineering Chair Norman Wereley (far right) at the ARCS Annual Partnership and Eagle Award Event held April 7, 2015 in Washington D.C. The ARCS Foundation advances science and technology in the United States by providing financial awards to academically outstanding U.S. citizens studying to complete degrees in science, engineering and medical research. Since 1958, ARCS Foundation has awarded more than $91 million to 9,000 ARCS Scholars at 54 leading U.S. universities.